We aim to dispatch your order on the day of receipt if ordered before 2.30pm subject to stock levels, company closure and bank holidays. Our delivery service is Platinum Express - Next Working Day Delivery (Mon-Fri). Next day is not guaranteed as the on time couriers delivery success rate is 96%. The carriers we use are APC and Tuffnells. Deliveries are generally made on weekdays only (Monday to Friday, excluding Bank Holidays) between 08:30am and 6.00pm and require a signature. If you do not receive your parcel or a calling card on the expected day of delivery please contact us immediately. If you are not at the delivery premises when a delivery is attempted, a card will be left with a contact number to re-arrange delivery. Please note that if you request your order to be left in a secure place, we cannot guarantee to do so but if we do, it's at your own risk. 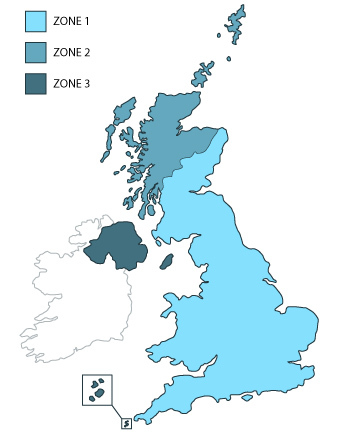 Zone 2: All deliveries to Zone 2 are subject to additional charges. Zone 3: *Currently Unavailable* on smaller orders. Machines and pallets of slush may still be shipped.